I found this spider when I moved some rough timber I had in the garden. I later found a nest of spiderlings nearby on the same timber . Is this Nuctenea umbratica? A shed is a very odd place for Pisaura mirabilis. Unfortunately I didn't get a photo of this spider but I noticed it while clearing out my mother-in-law's shed up in MidLothian. I didn't recognise the species and was interested enough to try and identify it. Apart from the odd house spider I've rarely seen many spiders up there and never one like this. This one had a body between 10 - 12mm and was dark brown in colour. Looking at the distribution maps this hasn't been recorded there before. Just to clarify the spider was crawling around on the outside of the door rather than inside the shed. It wasn't in a web. The spider was very distinctive and it was the shape of the abdomen that made me think it was this spider. I tried to look for it later on to take a picture but it had wandered off. Fine looking spider though. BTW are the house spiders moving north, I've been going to Scotland for 25 years and never really saw them there until about 10 years ago. Now there are a lot if my mother in law's shed is anything to go by. 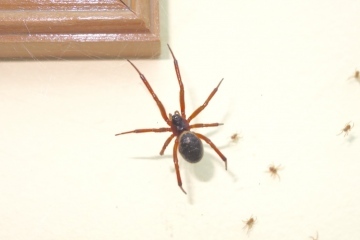 Please can someone confirm whether the spider on the attached photograph is a steatoda nobilis. It, and it's children, have taken up residence in our conservatory. I live in Chiddingly, East Sussex. Thanks in advance. Thanks, Peter. There don't seem to be any Araniella records for VC102, so at least the genus is new! Unfortunately the spider can't be confirmed without microscopical examination of the adult epigyne or male palp. There are four closely similar and variable Araniella species and although this one is probably Araniella cucurbitina in the wide sense, it could equally well be either Araniella cucurbitina sens. str. or Araniella opisthographa even assuming it is not one of the rarer species. One was found in Bruichladdich, Isle of Islay (NR6127) on 21st July 2015. This appears to be the first for vice-county 102. However, the person who reported it to me (see photos) found it on his car at that location having driven from his home in Caol Ila on the island (NR6942) that morning. I hope that my ID can be confirmed. It isn't possible to confirm Heliophanus to species without microscopical examination of the adult epigyne or male palp. Heliophanus cupreus id confirmation please. Photographed 30/6/15 on Ailsa Craig NX02389983. The spider was safely tucked away within a silk capsule, between a rat monitoring station (a plastic rock) and a stone, on a boulder/scree area. Thank you very much for your help with araneus angulatus. It seems our garden may have a good population? Many thanks, I was deceived by the body stripe and its ability to actually walk on water (not vegetation). 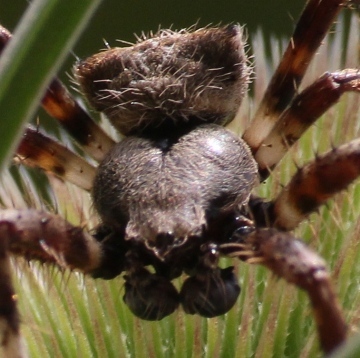 No, this is a Pirata wolf spider with spiderlings on her back. I hope this image is good enough to help people confirm if this is a Raft Spider, here in SK12 1TY. Seen on a small pond in the heart of a well established Local Nature Reserve (Cheshire East Council). Thank you. Adult male then, because of the palp structure. This individual was half the female size and has massive palps! (picture). Also the thorax was equal or larger than the abdomen. 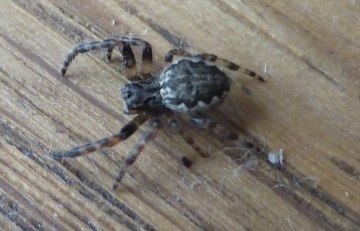 Yes Araneus angulatus, but I don't see the complex palps of a male, so I suspect this is a slightly shrunken female. 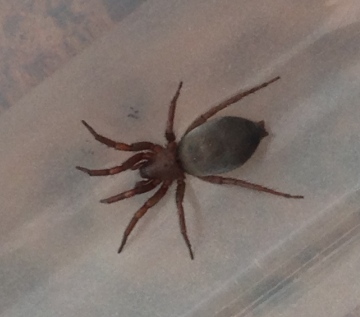 Is this a male Araneus angulatas? We recently found a female Araneus angulatas in our garden. We posted a picture of her up onto this forum on 28th June 2015 and you confirmed the ID. Today, at the top of a Teasel we spotted what we think is a male - would be very grateful for confirmation. 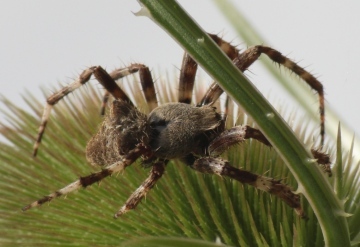 Your spider is Pisaura mirabilis, the 'nursery web spider. The female commonly sits out on leaves, and is very variable. She carries the egg-cocoon in her jaws until the eggs are about to hatch, when she constructs a tent-like web in tall herbage in which young remain until they disperse. I found this spider and web/nest at Wicken Fen National Nature Reserve on 4th July, whilst photographing dragonflies. Can you identify it for me please? Yes, this is Segestria florentina. Please provide a full postcode or Ordnance Survey grid reference and date of the record so that it can be added to the recording scheme. I believe this is a Segestria florentina. I found it the other evening. 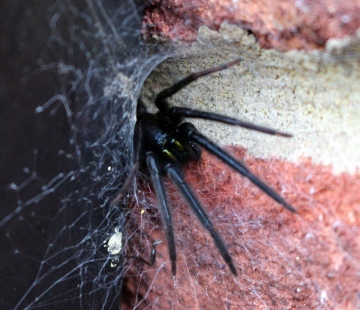 it appears to have a tube like web behind an external light attached to the brickwork of my house. It's jaws are a striking green colour. A very impressive and very fast spider. My location is the market town of Dursley in Gloucestershire. Postcode is GL11 5PX date of observation 2/7/15 Jason. This looks like the 'mouse spider' Scotophaeus blackwalli. There is a second species, Scotophaeus scutulatus, which has been found several times in the Colchester area, which looks exactly similar until adults are examined under a microscope, and there are another 2 European species as well, so there cannot be any absolute certainty. They are harmless to humans. I found this on my bedroom wall this morning in Bristol, BS16 7HE; I couldn't find any images on the net that had a similar abdomen. It was around 25mm in span.